Okay, better late than never. I put my back out this past week, so I am slow to getting this lesson posted. I am much better now, but I apologize for the delay. The first stage of this painting was to create a drawing from a reference photo that I took at a local nursery. I moved some of the leaves around to help draw the eye around the painting and to enhance what I wanted to be the focal point, the hibiscus. After creating the drawing, I enlarged it on my computer and printed it out on sheets of paper, which I taped together with clear tape. The drawing is now the size of a full sheet of watercolor paper. 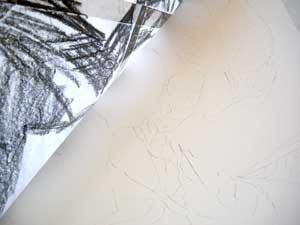 Then I scrubbed the back of the enlarged drawing with a Chunky Graphite Stick (can be purchased at CheapJoes.com). It's important to scrub hard and deposit a lot of graphite on the paper, so when the drawing is traced onto the watercolor paper, almost no pressure is required. This will prevent indentations in your paper from pressing too hard. These depressions can collect pigment and create ugly marks and lines in your painting. I tape the drawing in a few places along one edge to create a sort of hinge. 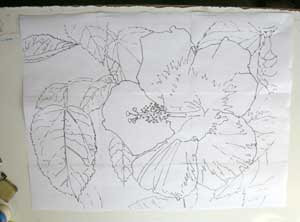 Now I can trace the image onto my watercolor paper, and lift the drawing occasionally to view my progress. Again, when tracing, use a light touch!! !